In just eight days — between a Wednesday afternoon and the following Thursday afternoon this past April — I went to six cities in China. It didn’t feel like I was traveling a lot. In each city, I had ample time to fully engage myself in various activities. I gave two talks to parents, one talk to teachers, attended a big conference, visited a factory, climbed up the so-claimed “the most beautiful mountain in China” — Huangshan (黄山, the Yellow Mountain) — had a reunion with my former students, and enjoyed many leisurely chats and meals with friends and relatives. So what made the traveling in China so easy? The high speed railway. 高 (gāo) by itself means tall or high, 铁 (tiě) means iron, but “high iron” is far from its actual meaning — high speed railway. The puzzling name reflects the heavy compounding nature of the Chinese language. 速度 (sù dù) means speed, combining 高 (gāo) with 速 (sù) forms the compound 高速 (gāo sù), which means high speed. Combining 铁 (tiě) with 路 (lù) forms 铁路 (tiě lù), which means railway. Gather 高速 (gāo sù) and 铁路 (tiě lù) together and you get 高速铁路 (gāo sù tiě lù), which means high speed railway. In short, 高铁 (gāo tiě). These days, when one Chinese asks another Chinese how he would travel to a place, the most frequent answer is “坐高铁” (ride the high speed trains). The construction of the high speed railway system started in 2004 and the trains went into service by 2007. It spans a total length of 12,000 miles, longer than the combined length of all the remaining high speed railways in the world. Tickets are booked online (mostly) or bought at the ticket windows inside the stations. It was very common to see a Chinese friend of mine picking up her phone, skimming through the train schedules, and in a matter of two minutes, have a reservation made. Buying the tickets online just a few days ahead of the travel date or at the train station on the same day of travel is fine. At the train station on the day of your travel, head over to a ticket machine if you are a Chinese citizen, scan your ID and your tickets will be dispensed. For foreign travelers, reserved tickets are manually issued at the ticket window. Therefore, it is wise to get to the station a little earlier in case there is a line to the ticket windows. Depending on the city — the bigger the city, the longer the lines are in front of the ticket windows — it can be as few as several people or as many as 20 or so people at a given time. 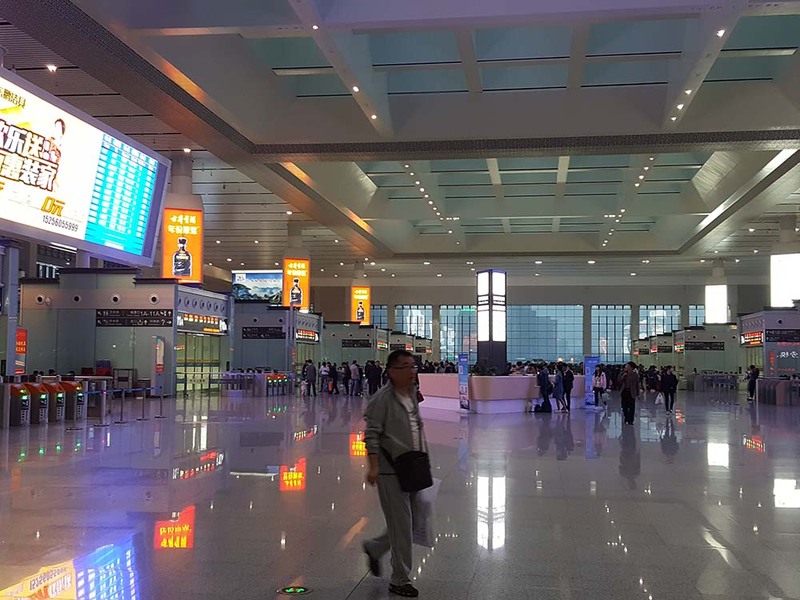 Inside the high speed railway station in Hefei, Anhui Province, China. Passengers boarding at the gates inside the high speed railway station in Hefei, Anhui Province, China. In all the cities, the high speed railway stations are built as separate stations from the old train stations that have served the cities for decades. While the old train stations tend to occupy a central location in a city, the high speed railway stations are usually at the outskirts of the city (but not as far as the airports). The old train stations tend to bare the word 站 (zhàn) — station — at the end, such as, 北京站 (Beijing Station) or 南京站 (Nanjing Station). To distinguish a 高铁 (gāo tiě) station from an old train station, a direction word — 东 (dōng) east, 南 (nán) south, 西 (xī) west, 北 (běi) north — indicating the relative location of the station to the city is used in the station name. Thus, there are 北京南站 (Beijing South Station) and 南京南站 (Nanjing South Station). Because all the high speed railway stations I had encountered in the earlier part of this trip have 南 in their names, I initially thought all of them are built to the south of a city. This was clarified when I got to Yellow Mountain, where the high speed railway station there is called 黄山北站 (Huangshan North Station). I boarded a train on a Saturday at around 6:25am from Shanghai to Nanjing. I arrived in Nanjing just after 8:00am and made it in time to attend a conference. On this ride, I overheard an elderly local woman on the train commenting that this trip used to take her more than 6 hours. Later that day after the conference, I boarded a train from Nanjing to Changzhou where I was able to enjoy an authentic local meal, give a talk to parents organized by a mental hospital, and arrived back to Nanjing just in time to mingle with the weekend subway crowd. A one-day trip like this used to take at least a couple of days. I boarded a train at 12:13pm from Huangshan (Yellow Mountain, south of the Yangtze River) and arrived in Beijing by 6:00pm. This gave me enough time to take a morning stroll deep in the mountains and taste some local wine in a nearby village before boarding the train in Huangshan, and making it to Beijing in time to have dinner with my two friends that same evening. When I ride with Amtrak along the Northeast corridor between NYC and Boston or DC, I often get motion sickness because of the bumpiness of the trains, but this doesn’t happen on the high speed railway trains in China; the ride is very smooth. Chinese style meals are sold on carts strolled up and down the aisle on the trains by uniformed female attendants. These 盒饭 (hé fàn) or “boxed meal” usually go for about 30 yuan ($5 USD) and you can order a cup of coffee (instant powder) for about the same price. In the old times on the trains, Chinese people liked to lay out their snacks on the trays then chatted and ate their way to the destination. These days, everyone’s eyes are glued to their mobile devices and their conversations are exchanged wirelessly. While this is definitely more tamed, but I must admit the atmosphere inside the cars is less vibrant than the past. The bathrooms are clean, but are all squat toilets and most likely you need to bring your own toilet paper. After decades of being a passive victim to a stomach cramp problem in damp weather, I decided to find a cure. I know that Western medicine is not going to do much for me, because in the past no doctor in NYC practicing Western medicine was able to diagnose my condition. A good friend’s father, whom I call Xue Laoshi, is a devoted amateur Chinese herbal medicine doctor in China. In his apartment, there is a wall of little cabinets each containing a particular type of herb. On the day of my visit, a young mother came in to pick up her medicine. Xue Laoshi handed her a few plastic bottles holding a brownish liquid. Xue Laoshi not only diagnosed this woman’s condition and prescribed her medicine, but he also prepared the medicine for her (Chinese herbal medicine generally requires intensive and detailed boiling or brewing instructions). A few months earlier, I told Xue Laoshi my symptoms for the first time. He then asked me a series of questions about my bodily functions and gave me a diagnosis. He prescribed two kinds of herbal medicine — one for preventive, the other for curing. During my visit, Xue Laoshi handed me two plastic bags of herbs with brewing instructions, in great detail, written on a piece of paper. Knowing that some of these herbal ingredients are very valuable and costly, I pleaded to pay him back and asked whether his other patients usually pay him. Xue Laoshi shook his head with a big smile and said, “物物交换” (wù wù jiāo huàn). 物 (wù) is the formal counterpart of 东西 (dōng xī), which means thing(s); 交换 (jiāo huàn) means exchange or trade; 物物交换 (wù wù jiāo huàn) means “quid pro quo” or trading something with another thing. Living in NYC, I’m perfectly comfortable with charging a friend for tutoring her child Chinese and then pay her for any work she does for me. But for most Chinese people, this is an awkward thing to do. Instead, Chinese people prefer getting something free of charge from a friend and then returning the favor. This kind of trading is a delicate dance that requires, most importantly, a good memory and some mental work. Once you get into it, you could enjoy this dance too. Nonetheless, 物物交换 can also be an excuse for someone who just wants to give. In Xue Laoshi’s case, when I asked to pay him back for the herbs, he immediately pointed out that instead of paying him money, I could instead help his grandson with English. While I only exchanged a few English sentences with his grandson, I’m sure he spent hours studying and researching my condition, and dug into his own pockets to pay for the herbs. My Chinese herbal mix from Xue Laoshi. On my second morning in China, I took a 7:00am flight (the only flight I took in China) from Beijing to Zunyi. The driver of my ride, Xiao Lai, insisted on picking me up at 5:00am so that I wouldn’t be late for my flight. Xiao Wei is a friend of my sister. He drove me free of charge and I was made to understand that he and my sister help each other all the time and charging me a fare would be a silly idea. I asked whether he drove for a company, he said, “我是开滴滴的。” (wǒ shì kāi dī dī de) — "I drive for Didi." Didi is a car service company that is modeled after Uber. Uber also exists in China and is popular, but so is Didi. However, Didi and Uber drivers are not considered to be legal commercial drivers. If these drivers are caught with a client, they are fined heavily. Just as we were approaching the departure drop-off gate at the airport terminal, Xiao Lai pointed to the lane below our highway and told me that just a few days ago, a Didi driver was caught with a fare at that spot and was fined 20,000 yuan. This driver had also just borrowed 30,000 yuan to purchase his car with an installment plan and after being issued the ticket for the fine that he must pay, the driver promptly jumped off a bridge and ended his life. 想 (xiǎng) means think; 不 (bù) means no or not; 开 (kāi) means open — the literal translation of this phrase is: someone “can’t think it open” or is taking a situation too hard. When someone can “think something open,” it means that person can understand and therefore accept a situation. 想不开 (xiǎng bù kāi) is a phrase used by Chinese people in the context of commenting on others’ extreme (usually tragic) behaviors, such as resorting to violence, hysteria or suicide to solve problems. 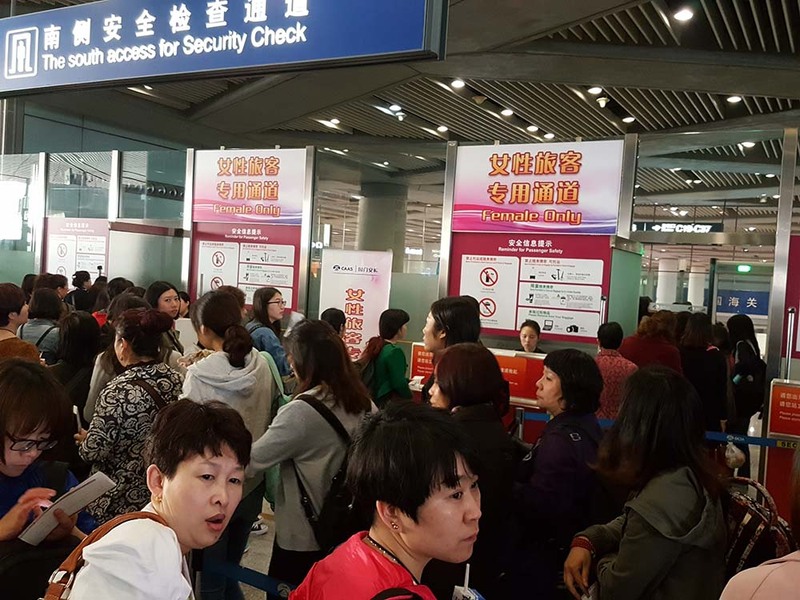 The security check seems to be the place where all passengers congregate at the airports in China — you can always count on there being long lines. One reason could be that the manual body scanning seems to be done in a much more meticulous manner than in the US. A security officer, usually under the age of 35, carefully scans your entire body, patting you up and down. At the receiving end, it feels ticklish. On my way to a flight departing for Zunyi, I arrived at the extremely crowded security checkpoint at Beijing airport. There were many doors and lines. While I was hesitating which line to join, I heard a young male security officer shouting, “那边有女士专用通道!” (There is a female only lane over there!). The "Female Only Lane" at Beijing airport. Without hesitation, I went and joined a long line with only female passengers. Soon I found out that the ladies seemed to take their time and were slower in every step of the process. I found myself constantly looking at the regular lines and comparing the speed and trying to figure out whether I had made the right decision by joining this 女士专用通道 (nǚ shì zhuān yòng tōng dào). I looked at the ladies in my line. No one was chatting or curious about this new initiative that may very well raise a few eyebrows here in the Western world. At that moment, it dawned on me just how practical Chinese people can be, in the sense that these ladies didn’t care much about the actual “segregation” practice. Instead, they only cared about whether or not the line is moving. It was the first time in my life that I was amongst such a large group of Chinese women. I was utterly touched by the powerful, yet serene, aura in the presence of these ladies. Throughout history, Chinese women have been the backbones of Chinese communities everywhere because of their profound spirit of tolerance and hard working nature. The high speed railway ride from Shanghai to Nanjing brought my family history into perspective. Along the way, the train passed lakes, rivers, ponds, and lush green lands, all interwoven together. The view was gentle, pleasing and soothing. 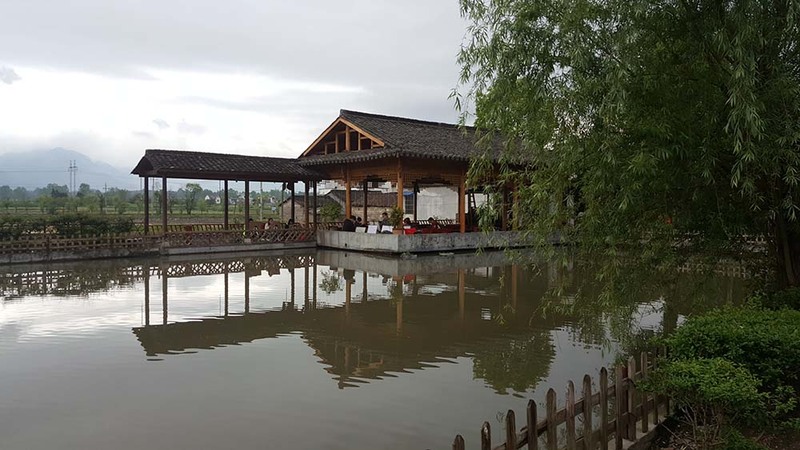 This area is near my parent’s hometown of Zhenjiang (镇江). Located in the lower plateau of the Yangtze River, it is also known as 鱼米之乡 (yú mǐ zhī xiāng). 鱼 (yú) means fish, 米 (mǐ) means rice, 之 (zhī) is the ancient form for ’s, 乡 (xiāng) means land or village. 鱼米之乡 (yú mǐ zhī xiāng) means the land of fish and rice (it is synonym to the Land of the Plenty). Fresh fish and rice have been in the regular diet of local people for thousands of years. My parents, in their early 30s, were both sent to the countryside of Shandong province in northern China. There, the mountains are bare majority of the year and the land is flat and without much water. When I was growing up, fresh fish and rice were only delicacies for Chinese New Year. Until I saw with my own eyes how 鱼米之乡 looks like during this train ride, I never fully appreciated the degree of adaptation my parents made all those decades. An important part of the Chinese standard of hospitality is to receive one’s guests from the airport and sending them off at the end. Another characteristic of such hospitality is to offer nice meals to guests — I have been treated with all kinds of nice meals. Everywhere I went, I was picked up at the train station or airport, and I never had to take a taxi getting around. My suitcases, even my purse, were often carried by my gracious hosts. I was treated with meals full of local delicacies, which I ate and offered my heart-felt compliments. In response, my hosts would always say that I’m someone that is “好招待” (hǎo zhāo dài), which means I’m so easily pleased as a guest (meaning I was not a demanding nor picky guest). In the hands of host that showers you with such hospitality, who would have a reason to behave as a guest that is “不好招待” (bù hǎo zhāo dài) — a guest that is "hard to please." I traveled with my sister most of the week. While I carried cash with me everywhere, I rarely saw my sister using cash. She either poked around on her phone or scanned her phone to pay. Foreign currencies in a bank account cannot be automatically converted into RMB, therefore, for E-payment to work in China, you need to have a bank account with RMB (the Chinese currency) that can be linked to a E-payment app — 支付宝 (zhī fù bǎo), also known as Alipay, is one of them. Alipay was developed by Jack Ma, founder of Alibaba Group, and is the Chinese equivalent of services like PayPal, Venmo, Apple Pay or Google Wallet. Alipay can also be linked to a social media app called WeChat where you can then make a payment by scanning a barcode. Even vendors on the street accept E-payment. In Nanjing, two friends (a young couple) of mine brought their daughter to play at the park. The daughter wanted a hotdog from a street vendor but none of her parents had cash on them at the time. So the father transferred 20 yuan (the minimum required for a transfer) to the vendor’s account, but the cost of the hotdog was only 5 yuan so the vendor gave the father 15 yuan in change back, but in cash! Electronic payment methods is called 网银 (wǎng yín). 网 (wǎng) means internet; 银 (yín) means silver and is the ancient word for money. In the context of linking bank accounts to Alipay or WeChat, the word 挂 (guà) is often used. It means to hang up something, such as — 挂画 (guà huà) to hang up a picture (on a wall), 挂衣服 (guà yī fú) to hang up clothes, 挂电话 (guà diàn huà) to hang up the phone. As for 挂 (guà) in the context of 网银 (wǎng yín), it means to connect. Therefore, you can say, “挂一个账号” (connect an account). One of the highlights of my trip was spending time with this unassuming but amazing guide named Xie Xiaoyan in the Yellow Mountain region. She accompanied my party and I up and down the mountains and told us many stories and personal experiences, bringing the rich local history to life. She told us that she could find local doctors who knew exactly how to treat a spectrum of health conditions — from knee problems to poisonous snakebites. She described how her mother tended the tea trees but was often unable to finish picking the young tea tips within a short span of just a little over a week before the young leaves grow too old for making tea. 忙 (máng) means busy. 很 (hěn) means very. 很忙 (hěn máng) would mean very busy. 忙得很 (máng dé hěn) also means very busy and is more colloquial. Like many others in the world, Chinese people are very industrious and entrepreneurial. No matter where they find themselves to be, they find ways to stride a living. Therefore, the folks in the Yellow Mountain regions of China are always busy tending to their silkworms, tea trees and flowers; trying to transform every silkworm, every tea leaf and flower into household income. 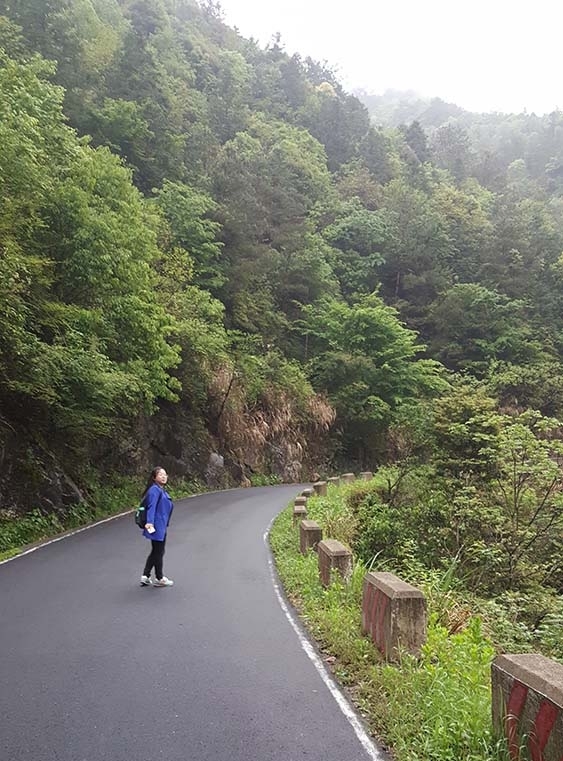 Xie Xiaoyan takes her morning stroll near her village in the mountains. Our Yellow Mountain guide, Xie Xiaoyan, took us to a village called 西屏 (xī pín) — an ancient village surrounded by mountains with only a small number of residents remaining. The village has very narrow lanes and paths connecting to individual houses. 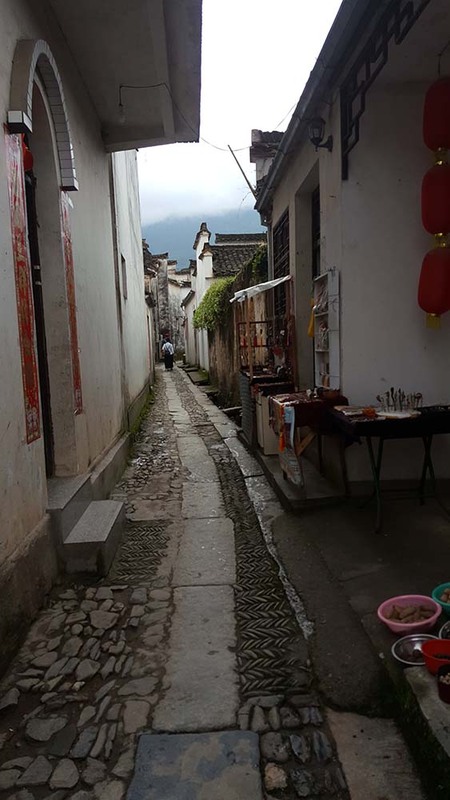 When I asked Xie Xiaoyan why it is that the lanes and paths are so narrow, she said, “寸土寸金” (cùn tǔ cùn jīn). 寸 (cùn) means inch, 金 (jīn) means gold. 寸土寸金 (cùn tǔ cùn jīn) means an inch of soil, an inch of gold. I have heard Chinese people using this phrase to comment on real estate in Manhattan, Beijing and Tokyo. In this case for this small village, it’s not about the square footage of a luxury apartment or house, instead, it is about farming — the livelihood of the residents that still farm the fields reside on every inch of the soil. So it truly is "every inch of soil is worth gold." A narrow path in Xiping village. As an outsider, I was mesmerized by the beautiful mountains surrounding this village. However, to the local folks who rely on what is under their feet to survive, the mountains present a depressing and ruthless view. This led to the local ancient custom of boys and young men either studying hard in hopes of becoming governmental officials or migrating to big cities to do businesses. This custom resulted in generations of women being left behind to take care of the fields, the elderlies and the children. Many of these women lived lonely lives because they were just “wives in name” while their husbands lived a separate life with their new families out in the big cities. These days, a young couple may migrate to bigger cities together, leaving their children back home under the care of their grandparents. In Xiping (西屏), I strolled into a store selling local tea and wine. I asked for the prices of some tea and the proper way to brew the tea, and then ended up buying some tea and tasted a few of their local wines. The storeowner gladly showed me his award certificates as a tea maker and told me that he makes all tea by himself. While chatting, I carried myself in my usual manner. When the storeowner was weighing some tea for me, he looked at me and said, “你看着很有修养。你是个老师吧？” (nǐ kàn zhe hěn yǒu xiū yǎng nǐ shì gè lǎo shī ba) — "You seem very cultured. Are you a teacher?" 修养 (xiū yǎng) is particularly hard to translate. 修 (xiū) on its own mean fix or trim. 养 (yǎng) means raise or cultivate. When someone is said to have 修养 (xiū yǎng), it means that person is well-raised or cultured. It usually means a person has good manner from the outside and with a sound sense inside. This storeowner quickly connected 修养 (xiū yǎng) to 老师 (lǎo shī) — teacher, so as you can see, the image of a teacher in the minds of the Chinese people is someone who is cultured. In contrast, when Chinese people see a person with poor manners or not being considerate of others, they would say this person 没修养 (méi xiū yǎng) — not cultured. When he heard that I may bring a group of children to the area in the summer, he said, “你们可以住在我们家。免费的。” (You can live in my house. Free of charge.) and I think he really meant it. Gisela Jia and the tea-maker (storeowner). Gisela Jia with Xiao Jing at Yellow Mountain. As usual, I insisted on paying for his expenses as I normally do for many of my students, and I did. At the end of the trip at the train station, as we were bidding farewell to each other Xiao Jing said to me, “不过还要让您买单!” (But you ended up paying for my expenses!). Part 12: 倒霉呗! - Just Bad Luck! On my way to the Beijing Airport for my return flight back to the US, my sister’s friend, Xiao Lai, drove me again. While driving, he answered a call from his mother. He later told me that his mom asked him to go visit a cousin of his in the hospital. As it turned out, this cousin, in his early 40s, was suddenly diagnosed with cancer. To add to the tragedy, the cousin is also a father of two very young children and is the only bread earner of the family with no insurance to cover his treatments. While I became worried for this cousin, Xiao Lai said in a light tone, “倒霉呗!” (dǎo méi bei). 倒霉 (dǎo méi) means bad luck, 呗 (bei) is a filler word used at the end of a sentence. When something bad happens, a Chinese person may say, “真倒霉！” (zhēn dǎo méi) — Just bad luck! Again, here is another example of how the Chinese manage to accept a situation if there’s nothing they can do to change it. One may say that “just bad luck” is a way to brush off what is in fact a very tragic situation, but I must admit there’s some philosophical wisdom in Xiao Lai's words that I admire. Instead of ending my essay on 倒霉 (dǎo méi) — bad luck, let me end it with something more positive. The entire Chinese population seems to be connected through WeChat — the popular Chinese social media app that can be used on mobile devices or computers — they chat with friends, buy and sell, teach and learn, all on weChat. Stay tuned for my next essay on WeChat!